or to find out more information. The Barn on 26 offers complete shipping and delivery service for pieces of all sizes and shapes. Many local deliveries are handled personally by Owner, Alice Welch, and staff. Long distance deliveries are arranged for customers through shipping professionals available in the area. Each shipment is customized to meet the needs and schedules of recipients. All items are completely insured and expedited according to the customer's request. There is no charge for a shipping estimate, so feel free to contact Alice Welch, at the shop to arrange for delivery of your purchases. Delivery service is door to door, and our customers "sing the praises" of our shipping professionals, so abundant references are available! The Barn on 26 offers appraisal services for estates, insurance companies and individuals. Free appraisals are available at the shop during normal business hours, by appointment only. Formally documented appraisals are performed for a fee, which varies according to the extent of the documentation. Please contact the shop for more information and appointment schedules. The owner, Alice Welch personally performs all appraisals, and references are available. The Barn on 26 offers full refinishing and restoration services for wood furniture and accessories, including chair caning and upholstery. A visit to the shop is the best testimony to the quality of workmanship offered by the Barn on 26 professionals. With the exception of painted items, all pieces are hand stripped to preserve the original patina of the wood. The stains used contain tung oil to nurture the wood prior to sealing. Pieces are then sealed with a sanding sealer, hand sanded and finished with several coats of clear satin lacquer finish. The finished product is brilliant, durable and not subject to fading over time. Each item is closely examined for necessary repair and regluing prior to finishing, and re-assembly of every piece, including hardware buffing, is professionally done. There is no charge for an estimate on refinishing orders, regardless of your final decision. Customers should contact Alice Welch at the shop to arrange for an appointment. Pricing is done on an individual basis, and a 50% deposit is required prior to acceptance of work, with the balance being due upon completion. Satisfaction is guaranteed, and many, many valid references are available after 28 years of service. Many folks do have questions regarding the merits of refinishing antique furniture. 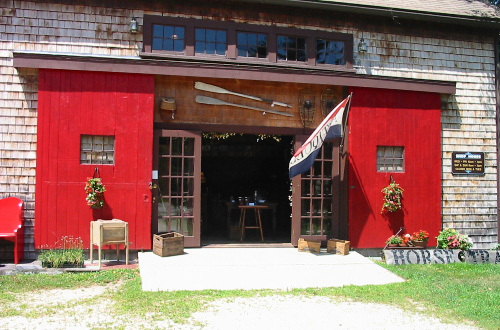 Please enjoy the following article written for the Coastal Journal, Bath, Maine, by Barn on 26 owner, Alice Welch.